As our promise, we are back to remind you that Utrecht Indonesian Day 2017 is just around the corner. 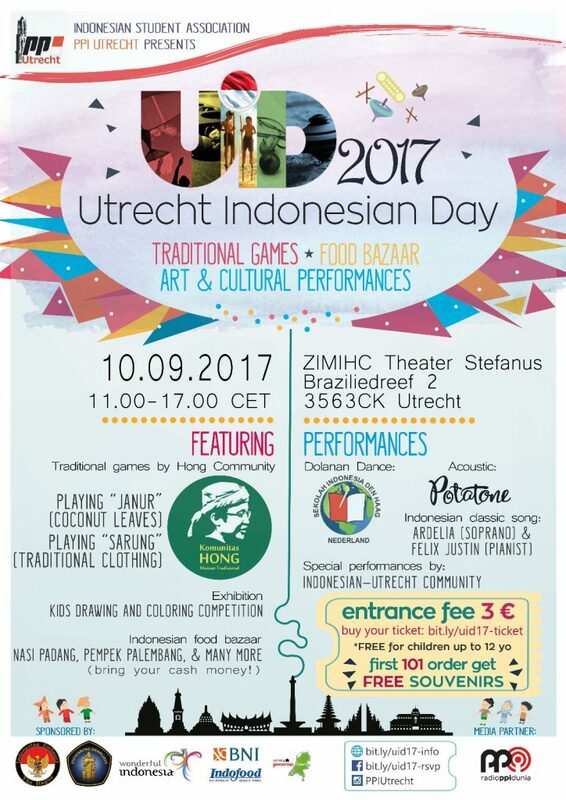 Utrecht Indonesian Day 2017, an Indonesian cultural event in Utrecht, back with a different face than usual. Collaborating with a professional community from Indonesia, we invite you to know more about Indonesian traditional games in our event this year. Unlike recent games that based on digital technology, Indonesian traditional games are more active, social, but still induce our creativity. If you want to know more about these fun games or simply want to bring your childhood memory back, come and join our workshop in UID 2017. We also held a colouring and drawing competition for children between 4 – 15 years old. Top 10 of each category will be exhibited during our event while top 3 of these will be granted with a prize. Only with 3€ as the registration fee, you can join our event. 101 people who register first will get a lot of free souvenirs from us. So, what are you waiting for? Book your ticket and see you there!